Liquorice has a long and highly varied record of uses. It was and remains one of the most important herbs in China. The two major constituents of liquorice are glycyrrhizin and flavonoids. Liquorice Root - capsule: Vegetable hypromellose (HPMC). Do not take if taking loop or thiazide diuretics. Below are reviews of Liquorice Root - 60 x 400mg by bodykind customers. If you have tried this product we'd love to hear what you think so please leave a review. 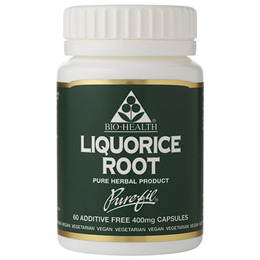 Liquorice has a long and highly varied record of uses. It was and remains one of the most important herbs in China. The two major constituents of liquorice are glycyrrhizin and flavonoids.